Western’s Facilities Management department has been recognized for all that energy the university put into saving energy. 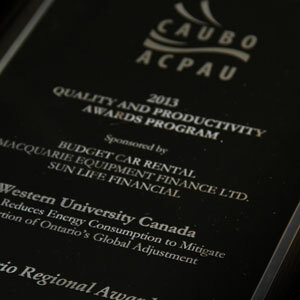 Earlier this week, Western was honoured by the Canadian Association of University Business Officers (CAUBO) with the 2013 Quality & Productivity Award-Ontario Regional Prize for the university’s energy-reduction plan. The award specifically recognizes Western’s efforts to mitigate its portion of Ontario’s Global Adjustment (GA) tax, a fee embedded within the university’s utility bill. In 2012, Western spent almost $16 million on electricity; $7 million of that total went toward the university’s contribution to the GA. By reducing electricity consumption last summer, Western will see that number come down dramatically – perhaps more than $1 million – this summer as savings are delayed a year. Since 1987, CAUBO has been celebrating the administrative achievements of its members with the Quality & Productivity Awards Program. The simple concept of sharing good ideas has grown into an established best practices program that celebrates the successes of our members and provides a venue for spreading the word. Facilities Management understands the need to accommodate building occupants and maintain steady climate levels. The target for an average office and/or classroom is set between 20 - 25C throughout the year.